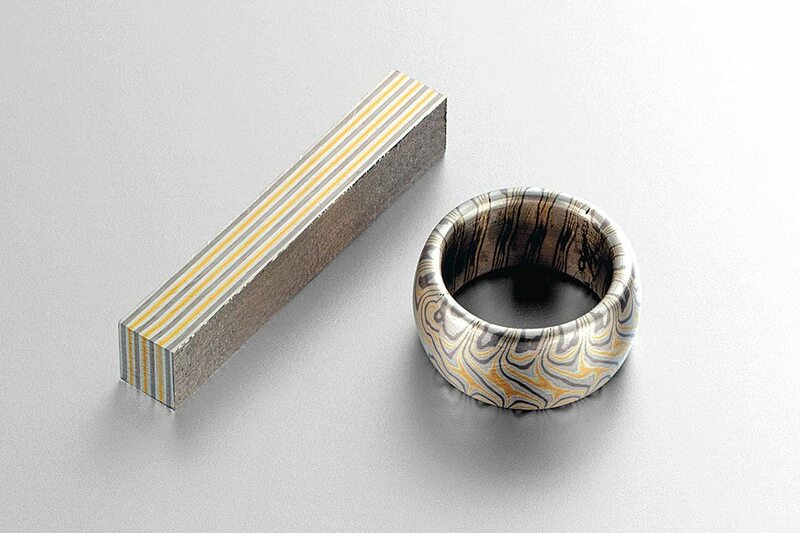 We have had a lot of interest in our Mokume Gane wedding rings recently so I thought it might be nice to write a blog post about the history of Mokume Gane and the process of preparing metal in this unique and ancient technique. 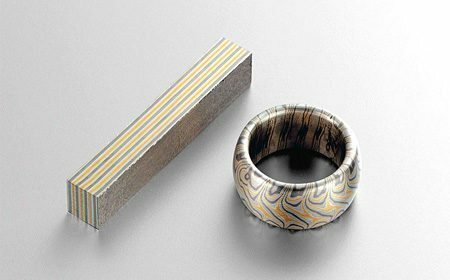 Mokume Gane, literally translated as ‘wood grain metal’, is an ancient Japanese technique of layering metals to produce a beautiful pattern. This method was developed by a highly skilled craftsman, Denbei Shoami (1651-1728), in Northwest Japan. The decorative metal was used to embellish sword handles and fittings. During the 18th and 19th centuries Japanese swords became an indicator of social status and wealth and so metalsmiths developed various new techniques to decorate these swords. One such method was Mokume Gane. The method is a complicated process of layering metals and fusing them together using a combination of heat and pressure. A new molecular crystalline structure is created between each of the layers so that they then become one homogenous mass. Once the layering of the metals is finished the metal is pierced/drilled on the surface to reveal the various layers. It is then forged/milled down to the desired thickness – this draws the pattern out in a wood grain effect. Any combination of metals can be used to provide different coloured patterns and the number of layers created will determine how detailed the pattern is. 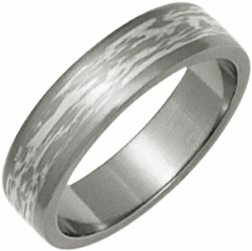 I particularly love this titanium wedding ring with Mokume Gane inlay – it is a union of modern manufacturing with ancient techniques. 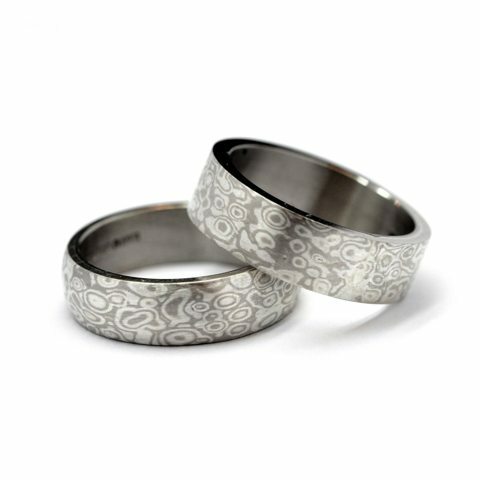 The Mokume Gane is made using layers of silver and palladium white gold – these two colours work beautifully with the almost charcoal colour titanium to create an unusual, modern wedding ring.